The exterior model keeps debris off the glass. They keep sunlight out thereby reducing the cooling requirement. Some people prefer the exterior model which usually snap into place on the outside of the vehicle. Unfortunately, I have yet to locate any made specifically for a EuroVan or Rialta. There are a multitude of the interior, mass-produced, discount-store brands that usually come in several sizes. 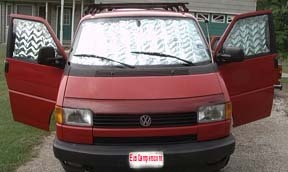 Because the EuroVan windshield is quite large, I suggest you buy the biggest size you can find. These types generally fold up like an accordion for storage. 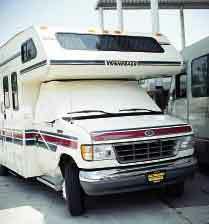 Installation is simple and the flip-down sun visors usually assist in holding them in place. The fit is not perfect but it doesn't have to be. Price varies from around $2 to $10. 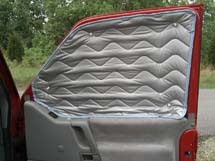 Probably the best of all worlds is the use of the "reflective window insulation kit" from EuroCampers.com and specifically designed to fit the EuroVan. The price for the 3-window set seen here is around $70. No images, artwork, or photographs may be used without permission.